The most definitive evidence yet that the Shroud of Turin is not a medieval fake-relic. This is big stuff, published on a highly respected scientific organizations website, the Institute of Physics, a 37,000 member organization of physicists. Their journal is an ethical journal of peer-reviewed scientific studies. The Washington Times, BBC, the Observer, the Telegraph of London, ABC Australia, the Chicago Sun-Times and several outlets have picked up the story in the last few hours. In my opinion it reinforces the already clear proof that the carbon 14 testing in 1988 was completely erroneous. It clearly eliminates the polemics of medieval paintings, da Vinci conspiracies, proto-photography and other silly concocted theories being bantered about by those skeptical of Christianity. If it is a genuine burial shroud of a 1st century victim of crucifixion, it can almost certainly be inferred that it is Jesus. If that is so, it buries the extra-liberal revisionism of John Dominic Crossan and Marcus Borg who argue that Jesus was not buried. If it is a genuine burial shroud of a 1st century victim of crucifixion, how is it that this piece of cloth survived the grave and was not ravaged by decomposition products? The story at the link is quite technical. I suggest alternatively reading the stories in any of the various newspapers or for a clear concise explanation read first Chemistry of the Image and then Explanation of the Backside Image. 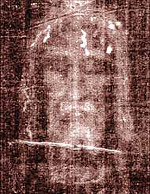 From the extract: “Photographs of the back surface of the Turin Shroud were analysed to verify the existence of a double body image of a man. The body image is very faint and the background not uniform; i.e., the signal-to-noise ratio is lower than one. Therefore, image processing . . . was necessary to highlight body features. This was based on convolution with Gaussian filters, summation of images, and filtering in spatial frequency by direct and inverse bidimensional Fourier transformations. It is my opinion that this is near-definative evidence that the Shroud is genuine. It is my opinion that this is near-definitive evidence that the Shroud is genuine.Agreed.No one has come up with anything remotely capable of explaining how a painter from the Middle Ages could have faked this kind of double image, or that needed this kind of enhancement to see. The other remarkable features of the shroud were sufficient IMHO, but this seems to seal the case.However, I expect to see near hysterical denials that it is of Jesus Christ. Such a thing would have implications that are simply unacceptable to many people. Good find. The nice thing about IoP is that you can download the journal articles at no charge for 30 days from the date of publication (beyond that you’ll have pay a hefty fee for the download). > No one has come up with anything remotely capable of explaining how a painter from the Middle Ages could have faked this kind of double imageHmmm. How about this: the painter painted both sides?Not exactly challenging… just paint one side, hold up to the light, paint the other side. Easy. > I expect to see near hysterical denials that it is of Jesus Christ.What I find funny is that any scientist who looks at the evidence and says, “Nah, it’s a fake,” will be hysterically described as being in hysterical denial. Much of the current thinking in the Shroud skunkworks is that the correspondance is within the tolerance ranges of gaseous diffusion of heavy amines. Other possibilities, without regard to miraculous causation, would include an ionizing radiation or corona discharge — though some physicists have real problems with this.The differences, such as the nose on the reverse side which doesn’t show the same extension as the front, are probably completely due to chemical reaction differences, image inhibition by bloodstains, and diffusion of amine reactants if the catalyst or the reactant is gaseous.I am not a physicist either, but I know what sort of scientist Fanti is and I know what sort of scientist Ray Roger, UCLA fellow and former head of the bomb explosives group for the Los Alamos Laboratory, is, and they agree emphatically that this rules out forgery or any form of artistic or crafty technique.Fanti’s words are clear: “It is extremely difficult to make a fake with these features.”In fact, the skunkworks group has been working with the double superficiality of the images for some time now. It is hard to imagine how this could be mechanically or artistically produced. PII: S1464-4258(04)70555-3The double superficiality of the frontal image of the Turin ShroudSo, basically, these guys are stating that after running photographs of the back of the Turin cloth through lots of image processing filters and doing a bit of tweaking, they were able to discern faint blurs that bled through from the other side. That convinces me! It must be Jesus! What I find funny is that any scientist who looks at the evidence and says, “Nah, it’s a fake,” will be hysterically described as being in hysterical denial.To say it’s a fake without any idea of HOW it could be faked is simply denial. Thus far, no one has any idea how the image could have been faked. You know, we haven’t entertained the theory that Happy is actually Joe Nickell, trolling around Shroud threads. Could be. “It should be noted that the image of the face, bs, is found in the same position as the corresponding one on the front, in all its detail, and on the same scale, with non-detectable relative rotation within the range of measurement uncertainty (3% for the scale factor, 3 degrees for relative rotations).”In other words, no significant difference in image position with respect to front and back surfaces. Hmmmm dead links. I guess you don’t want readers to see that your sources are an article that was written in 1908 and copyrighted in 1912, since superceded in the Catholic Encyclopedia in 1968 (still outdated but nowhere nearly as biased as the one YOU like to cite).And that the other is to Joe Nickell, PhD in Art and English, no science to his name, a professional “debunker” with a book to sell… more on that later, Happy. NO ONE believes that the image was painted – even those who do not believe it is a true death shroud acknowledge it could not have been painted. I would have said that it is extremely easy to make a fake with these features, since by the 21st c. we are so clever…and then, if it is just a matter of some sugars and starches, let these brilliant physicists of ours replicate it. Can someone not make a linen as linens were made, dry it in the sun, cover a dead critter for a few hours and see what they get? If it’s gaseous diffusion of heavy amines it should happen with the usual reliability of natural phenomena.This chemical explanation is fine with me but can they demonstrate it? Thanks for the links. The second one, dating from April 9, 2004 was VERY interesting! > To say it’s a fake without any idea of HOW it could be faked is simply denial.Incorrect. Here’s the logic:Theory: This is the Actual Shroud OF Jesus. > The color is within a thin carbohydrate film that is 180 to 600 nanometers thick on fibers that average 13 microns in diameterHeck, that’s *easy. * Paint the image on a sheet of paper, place cloth on paper, press. SHAZAM! Instant Shroud, ready to recieve income. Carbon dating puts it at less than a thousand years old. Theory conclusively refuted.Guess you’re not up to date on the carbon dating actually used.The sample used was from a corner the Catholic Church felt was not essential to the shroud. It had been contaminated in a fire, and restored in a way that invalidated its use for carbon dating purposes. In addition, it was subsequently shown that the individual fibers in the shroud had grown a biological “sheath” that was not removed prior to testing, and added new biomass to the original material. Since this new growth was obviously younger than the shroud itself, it undoubtedly changed the tested age of the sample.Attempts have been made to mathematically correct for these problems. You may choose to dispute the math, but the correction results in a first century date for the shroud. In regards to the carbon 14 testing which has been completely discredited: M. Sue Benford and Joseph Marino, in collaboration with number of textile experts, identified clear evidence of medieval mending on the Shroud. A patch was expertly sewn to or rewoven into the fabric to repair a damaged edge. It was from this patch—quite likely nothing more than a piece of medieval cloth—that the samples were taken. From documenting photographs of the sample areas, the textile experts identified enough newer thread to permit Ronald Hatfield, of the prestigious radiocarbon dating firm Beta Analytic, to estimate that the true date of the cloth is much older—perhaps even 1st century.Independently, Anna Arnoldi of the University of Milan and Raymond N. Rogers, a Fellow of the University of California Los Alamos National Laboratory have explored the chemical nature of the sample area. They have confirmed the finding of Benford and Marino. Ultraviolet photography and spectral analysis show that the area from which the samples were taken was chemically unlike the rest of the cloth. Chemical analysis reveals the presence of Madder root dye and an aluminum oxide mordant (a reagent that fixes dyes to textiles) not found elsewhere on Shroud. Medieval artisans often dyed threads in this manner when mending damaged tapestries. This was simply to make the repairs less noticeable. The presence of Madder root and mordant suggests that the Shroud was mended in this way.This photograph, by Vern Miller, was taken before the samples carbon 14 testing were cut from the Shroud. It was taken with a heavily-filtered ultraviolet lighting (black light) that did not emit any visible light at all. All of the light you see in the photograph was produced by the fluorescence of chemical compounds on the Shroud. Any variations in color and brightness are a direct result of the chemical composition.The dark brown region across the bottom of the picture is the mended area. The place from which the carbon 14 samples were cut is in the dark brown area just above the tiny triangular white spot located on the bottom edge. (The tiny white triangle is where a small sample was trimmed from the Shroud in 1973 by Gilbert Raes).Microchemical tests also reveal vanillin (C8H8O3 or 4-hydroxy-3-methoxybenzaldehyde) in an area of the cloth from which the carbon 14 sample were cut. But the rest of the cloth does not test positive for it. Vanillin is produced by the thermal decomposition of lignin, a complex polymer, a non-carbohydrate constituent of plant material including flax. Found in medieval materials but not in much older cloths, it diminishes and disappears with time. For instance, the wrappings of the Dead Sea scrolls do not test positive for vanillin.This is an important find. It suggests that the tested samples were possibly much newer and it underscores that the chemical nature of the carbon 14 samples and the main part of the cloth are outstandingly different. > . It had been contaminated in a fireExcept, of course, fire does not invalidate carbon dating.> and added new biomassThis is another red herring. The mass of “biosheath” required to throw off the dating by the required amount would exceed the mass of the shroud itself.The carbon dating may be off by a few dacades, tops. That’s why, when it’s presented, it’s always presented with error bars. The carbon dating still stands. Maybe this chart will help. The carbon 14 testing, sadly attested to in Nature Magazine in 1989, joins the ranks of junk science. It wasn’t the labs that failed. It was the gross incompetence of the sample selection process. The carbon dating still stands.The post immediately prior to yours (probably posted while you were writing your reply to me) addresses your statement in detail. To sum up the current state of the scientific investigation, the carbon dating does NOT still stand.As additional information you might consider the book, The Blood and the Shroud, by Ian Wilson, published in 1998. To quote The Washington Post (sorry ’bout that), “Wilson’s outstanding study must surely be the most complete yet undertaken of the subject.” Although it is the most recent book I have personally read on the subject, you can probably find more up to date info. However, it is quite readable and answers most of the non-radiocarbon dating questions quite well.The recent discoveries (repairs at the site of sample used for radiocarbon dating, 1st century stitching methodology, image on the back) are obviously not addressed in the book.Since you raised the radiocarbon dating question, I should re-emphasize the two points I made in my earlier post: fire and biocontamination. Both are addressed in the above referenced book, and both have the potential to skew the results substantially more than you might realize.1. The fire had the potential to cause a chemical change in the type of fibers in the shroud, binding carbon items from the atmosphere at the time of the fire. 2. The biological “sheath” was quite thick, resulting in enough biomass to skew the results substantially. These two points are separate from the repairs made to the cloth at the site of the sample, which is sufficient to invalidate the radiocarbon testing all by itself. Theory: This is the Actual Shroud OF Jesus. Refutation: Carbon dating puts it at less than a thousand years old. Theory conclusively refuted. So we have a C14 Sample that is:CHEMICALLY different from the body of the Shroud in that it contained Rose Madder-root Dye, Aluminum Oxide (bauxite), Gum coating on the fibers as a mordant (a chemical to “bite” into the linen to allow dyes to adhere), and Vanillin (a decomposition product of lignin that disappears over time), and other chemicals not found elsewhere on the Shroud. PHYSICALLY different because the patch fluoresces significantly under an ultra-violet light while the rest of the Shroud material fluoresces dimly, The C14 Sample shows significant differences as a TEXTILE in that the threads of the patch were spun in an “S” (counter-clockwise) twist while the entire rest of the Shroud was spun with a “Z” twist. In addition, the average thread size of the C14 Sample is “significantly” (statistically) smaller than the average thread size of the Shroud. The fibers composing the threads of the patch include WOOL and European COTTON which is found NOWHERE ELSE on the Shroud. Finally, the linen of the C14 sample was “retted” using a completely different process from the rest of the Shroud. The location where C14 sample was taken. The samples provided to the Zurich C14 Lab (top) and the Oxford lab. with the original shroud material. in direction of the “woof” (horizontal) threads. Catholic Counter-Reformation WebsiteBryan J. Walsh’ statistical analysis of the C14 tests performed by the three laboratories show that given the accepted accuracy of the tests, the test results and the reported ages of the 11 tests (three labs Arizona, Oxford, and Zurich, four samples cut into 11 sub-samples (A-4, O-3, Z-4) for testing) COULD NOT HAVE COME FROM THE SAME HOMOGENOUS POPULATION! In other words, the test results varied so greatly that statistically they could not have come from the same sample! Yet we know they did. Plotting the age variances in the samples show that the age reported is inverse linear proportion to the distance from the edge of the Shroud toward the center. At the time the statistical analysis was done, the evidence of a patch had not been found. The data and statistical analysis by Walsh is equally valid if it is not distance from the edge of the cloth but rather proportion of patch to original material in a diagonal change across the flawed sample that results in the statistically anomolous results. This is proof that the samples, although cut from the Shroud, and then further cut from the same sample WERE NOT HOMOGINOUS… and in fact were made up of OLD shroud linen intermixed with NEW patch linen.Ergo, the test was flawed from the beginning. It is akin to finding a note on a piece of paper scotch taped to the flyleaf of a book, taking that page, including the scotch taped piece and testing it to find the age of the book. The sample was corrupted by additional anachronistic material, the results are wrong. I just visited your website. Quite impressive!The last time I read anything extensive on the shroud was five years ago, with occassional articles since then as updates. It is obvious: I am quite out of date! Nope. Fire does not do that to any recognizable degree. As pointed out, it’d have to be several times the mass of the shroud itself. If that were the case, the face would be invisible under the much. Ben Witherington, a well-known, very conservative and respected biblical scholar, wrote that the carbon 14 tests are now significantly disputed. He cited the same material as presented by EternalHope. Until recently, that was the going hypothesis. You are right in saying that the mass of bioplastic would need to be significant. You said more by mass but actual calculations say by as much as 60% because the bioplastic has a moving average age.The scorching proposal that high temperatures from a fire in 1532, which damaged and nearly destroyed the Shroud, enhanced the mix of radioactive carbon 14 and stable carbon 12 isotopes in the cloth is dubious but not completely eliminated. But experiments to test this idea have not been promising. Any change caused by the fire would likely be too trivial to be significant.The data was not refuted until recently, and in the best of scientific method, not until a complete analysis could be completed. Even Harry Gove, inventor of AMS carbon 14 tools, was open to the possibility pending full investigation.The evidence by numerous researchers including Bryan Walsh, M. Sue Benford and Joseph Marino, Anna Arnoldi of the University of Milan and Raymond N. Rogers, a Fellow of the University of California Los Alamos National Laboratory is now complete. Ron Hatfield of Beta Analytic has even estimated from the composite data that a 1st century date is a reasonable estimate.Is the cloth really first century? I think so. Other evidence suggests it is. New carbon 14 testing would be a good solution, but it is one that I don’t think the Turin authorities are about to entertain in the foreseeable future. I really do believe that it is a burial cloth of a first century crucifixion victim. And if it is, it is easy and reasonable to infer that it is Jesus’ burial cloth. It completely agrees with the biblical narratives of the Passion. Its fuzzy history is better than most history we have for an object such as the Shroud. I am convinced, and not lightly so. The fact is there may be some bioplastic material and there may be some ion transfer due to the fire, but they are probably a minor factor. The reality is that the radiocarbon dating labs did not test the Shroud but a medieval patch. > The scorching proposal that high temperatures from a fire in 1532, which damaged and nearly destroyed the Shroud, enhanced the mix of radioactive carbon 14 and stable carbon 12 isotopes in the cloth is dubious …It’ silly, is what it is. Fire does not effect isotopic ratios of carbon.> I really do believe that it is a burial cloth of a first century crucifixion victim.Then that victim was an alien, because the shroud does not conform to human geometry when actual attempts to fold replicas around humans or humaniform manikens have been attempted. It just doesn’t work. Then that victim was an alien, because the shroud does not conform to human geometry when actual attempts to fold replicas around humans or humaniform manikens have been attempted. It just doesn’t work.Besides, it had to be an alien. Who else would glow-in-the-dark inside a shroud? You wrote: “It’ silly, is what it is. Fire does not effect isotopic ratios of carbon.”You meant heat, right? In a fire, definate contamination from movement of gaseous products can change the overall molecular level mixture. The heat does not change isotopic ratios of carbon; on that point you are right. But what is the point. It is trivial and not the cause of the carbon 14 error.As for alien: hmm. Do you know how the image was formed? As we do not know, and as we do not presume a contact mechanism, I don’t know how we can simply say it does not conform. The image does definately appear to be collimated. I don’t know how the image was formed, and like you I agree that it does not conform to human geometry — but only for contact mechanisms. I am quite certain it was not faked. > In a fire, definate contamination from movement of gaseous products can change the overall molecular level mixture.Errrr…. no. A piece of linen on fire still only has it’s own carbon. Fire does nothign to it, with the exception of turning some of it to carbon dioxide, and this is doen at an equal ratio regardless of isotope. Any carbon dioxide in the air nearby *remains* carbon dioxide at any fire temperature likely to be found Way Back Then.> Do you know how the image was formed?Artificially seems by far the most likely explanation.> I am quite certain it was not faked. Shroudie, this guy is not looking for an answer… he has it. He chooses to ignore the evidence right in front of his face and prefers to continue to attack already discounted and discarded theories just as Joe Nickell does.My post should have layed out the evidence so that anyone on FreeRepublic can see it plainly. The C14 samples are pictured and the OBVIOUS change in material from one side to the other can be plainly seen. The FACTS have been laid out for him as well as others but he CHOOSES not to look. Therefore his position is willfull and fearful. He does not WANT to see the facts in front of his face, so he WILL not.He is afraid that the facts might invalidate his world view because he cannot refute them. Since he can’t refute the latest “Flawed Sample” proof, he falls back on the “Fire Changed Carbon” or “Bioplastic Coating” theories that CAN be refuted and ignores any attempt to agree with him about the old theories and point out the newly proved fact.You warn him about the elephant in the corner of the room and he says “What elephant?” looking everywhere but at the elephant infested corner.This mind is not only closed, it is hermetically sealed. In a fire, definate contamination from movement of gaseous products can change the overall molecular level mixture.Errrr…. no. A piece of linen on fire still only has it’s own carbon.Errr, Orionblamblam, were you aware the fire under discussion was not JUST the shroud burning all by itself, but included a wooden cathedral, the silver chased reliquary, the draperies draped over the reliquary, books, wooden statues ALL of which contributed carbon from their medieval grown source plants in the form of soot that COULD have infused the linen of the Shroud. With sufficient heat, carbon from those sources could be included with the sample that was later Carbon 14 tested.That being said, there IS NO EVIDENCE on the Shroud of soot from those sources and certainly not in sufficient quantity to skew the C14 date by 1200 years.At the submicroscopic level there is evidence of the Bio-plastic coating on individual fibers of the Shroud’s threads. However, it TOO is insufficient in quantity to skew the date that much. Both soot and germ poop together are insufficient to skew the date by that much.Both of these theories of why the Carbon 14 dates were so out of sync with the other scholarship are irrelevant! WE KNOW WHY THE C14 DATA IS WRONG. The impeccable work done by the three C14 laboratories was doomed to failure from the moment the agreed testing protocols were discarded (literally at the last moment) in favor of taking the sample from the ONE area on the Shroud almost all scientists involved in the project agreed should be avoided. The labs were given samples that were not exemplar with the main Shroud material in that it contained added a large percentage of contemporary FRENCH linen rewoven into the Shroud linen in either 1535 or 1552 by the Nuns of Poor Clare when they were repairing damage done to the Shroud over the years. It is so obvious you can even SEE the change from one type of linen to the other in the pretest photos of the actual tested samples in Reply 30 which presents a summary of the evidence. I fully understand. If he wishes to believe as he does, that is fine with me. If he wishes to shape reality to his “faithview” that is also fine. I don’t respect his total misrepresentation of evidence to others. You and I agree. That is why I continue to counter those who continually spout the Joe Nickell line of completely outdated “factoids” and why I maintain the Shroud of Turin Ping list.So many people claim to be of a “scientific mind” yet have theirs completely closed… and in fact have latched onto one of the scientists like McCrone who have completely misrepresented what they have found and ignoring EVERYTHING else. Scientific dogma is worse than any Religious dogma around because the practitioners claim to be open-minded. Reuters is now carrying the story. Of course they mention the carbon 14 testing and ignore the findings that dispute it. I guess they don’t read National Geographic. But the main point of the story is the challenge the second face poses to skeptics and debunkers. Overall a plus.http://www.reuters.com/newsArticle.jhtml?type=scienceNews&storyID=4835816&section=newsExpect another explosion of data soon when Rogers’ peer-reviewed article appears (so as not to suggest that I am stating anything out of school, National Geographic has announced it). 2: Soot, which would be cleaned off.The mass of any soot that *could* become “infused” into the linen is far less than the mass of the linen itself.> With sufficient heat, carbon from those sources could be included with the sample that was later Carbon 14 tested.Only if the heat was sufficient to turn the linen itself to ash. The “dead horse” here is the idea that a shroud that appeared in the middle ages, an era of a thriving market in religious forgeries, was somehow the One True Shroud Of the Theoretical Jesus. > Since he can’t refute the latest “Flawed Sample” proofIt’s hardly proof. There are patches that MIGHT be more recent. But even if so… how much more recent?The obvious conclusion to draw from any such thing as the shroud is Forgery. Forgeries are far more common than True Miracles; consequently, it is up to the believers in miracles to provide their evidence that the shroud is anything more than clever art. So far, that has not been done.Hell, for all we know, the shroud could well be 1st century… taken from a burial, sold to an artist, who then painted on it. Given that there is no blood on the shroud but there is iron oxide and other pigments…Occam’s Razor. The obvious conclusion to draw from any such thing as the shroud is Forgery. Forgeries are far more common than True Miracles; consequently, it is up to the believers in miracles to provide their evidence that the shroud is anything more than clever art. So far, that has not been done.Actually, it is not up to anyone to prove to you that it is real. There is ample evidence that it is not been proven to be a fake and no evidence that it is. There is significant evidence to make a strong case that it is a first century burial cloth. As for miracles, we need only concentrate here on the formation of the images. Much work is being done to show that they might be the result of a perfectly natural phenomenon. Of course, if they are miraculously induced images it is unlikely that science could prove that.Hell, for all we know, the shroud could well be 1st century… taken from a burial, sold to an artist, who then painted on it. Given that there is no blood on the shroud but there is iron oxide and other pigments…Good stretch in thinking. (Oh, did you miss the point about their being blood and no concentrations of pigments or iron oxide to form an image). Now for that to be so we must assume that the cloth was separated from the body it contained. We must, of course, consider Jewish attitudes regarding blood. Now you might develop your theory a bit more to think that Romans unwrapped the body or maybe they had some of their Syrian slaves do it.Occam’s Razor you say. Are you for real?theortical Jesus ??? I guess if you put no stock in history you probably put no stock in science either. Maybe this explains where you are coming from. The lengths to which atheists and agnostics will go to deny that this is Christ is laughable. If the image is on both sides, then that is compelling evidence. I’m anxious to see what comes of this. I am one “fundamental” ( I prefer evangelical) who believes that the Shroud of Turin is the Genuine Grave Cloth of Jesus Christ.And that the image thereon was a result of the Physics of the Resurrection. 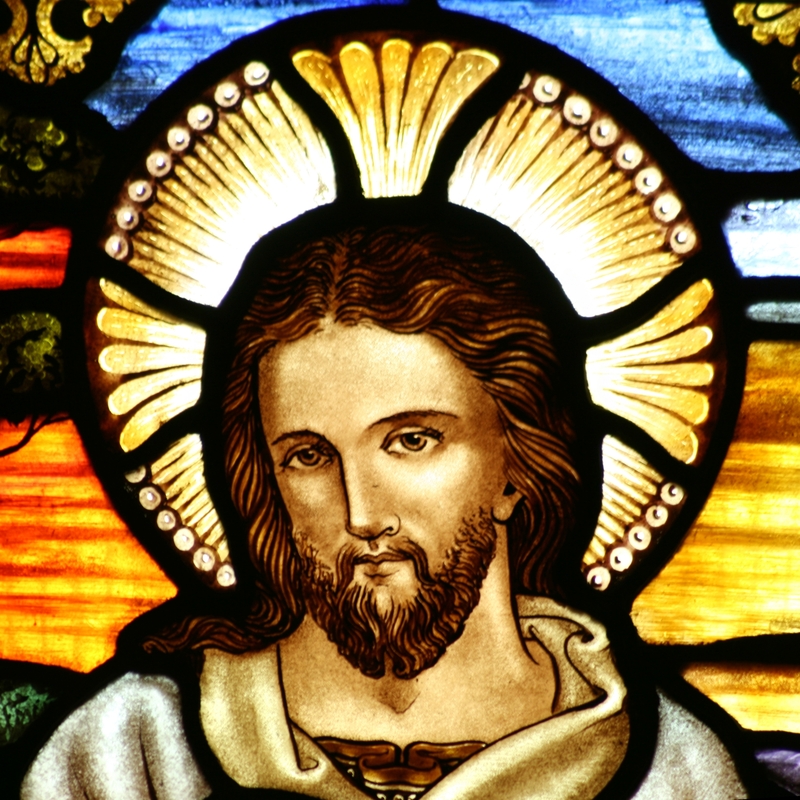 Shroud of Turin: Could quake explain face of Jesus? Can someone simultaneously be a Mason and a Christian? “Every Masonic Lodge is a temple of religion, and its teachings are instructions in … the universal, eternal, immutable religion….” Morals and Dogma of the Ancient and Accepted Scottish Rite of Freemasonry, by Albert Pike, Washington D.C., 1958, pp. 213, 219. “[Masonry is] … the custodian and depository (since Enoch) of the great philosophical and religious truths, unknown to the world at large….” Morals and Dogma of the Ancient and Accepted Scottish Rite of Freemasonry, by Albert Pike, Washington D.C., 1958, p. 210. “Without this religious element it would scarcely be worthy of cultivation by the wise and good….” An Encyclopedia of Freemasonry, by Albert G. Mackey, 1921, pp. 618-619. Freemasonry utilizes deceit to hide the truth from 1st through 29th degree Masons; and Freemasonry’s god is a triune deity called JoaBulOn which stands for Jehovah, Baal, and Osiris. “Masonry, like all the religions, all the Mysteries, Hermeticism and Alchemy, conceals its secrets from all except the Adepts and Sages, or the Elect, and uses false explanations and misinterpretations of its symbols to mislead those who deserve only to be misled; to conceal the Truth, which it calls light, from them…. Truth is not for those that are unworthy….” Morals and Dogma of the Ancient and Accepted Scottish Rite of Freemasonry, by Albert Pike, Washington D.C., 1958, p 104-105. “The Blue Degrees are but the outer court…of the Temple. Part of the symbols are displayed there to the [lower] Initiate, but he is intentionally misled by false interpretations. It is not intended that he shall understand them, but it is intended that he shall imagine he understands them.” Morals and Dogma of the Ancient and Accepted Scottish Rite of Freemasonry, by Albert Pike, Washington D.C., 1958, p. 819. God is known as “the nameless one of a hundred names.” Henry Wilson Coil, “A Comprehensive View of Freemasonry,” Richmond: Macoy Publishing, 1973, p. 192. “God is equally present with the pious Hindu in the temple, the Jew in the synagogue, the Mohammedan in the mosque, and the Christian in the church.” Albert Mackey, “Mackey’s Revised Encyclopedia of Freemasonry,” Richmond: Macoy Publishing, 1966, 1:409-410. Freemasonry is not Christian. If it’s not Christian, but it is a religion (which Masons have confirmed above), then it by definition conflicts with Christianity. Thus, logically, one can’t simultaneously be a Christian and a Mason. “Freemasonry is not Christianity … it admits men of every creed within its hospitable bosom….”An Encyclopedia of Freemasonry, by Albert G. Mackey, 1921, pp. 618-619. “[Masonry] … sees in Moses … in Confucius and Zoroaster, in Jesus of Nazareth, and in [Mohammed] great teachers of morality and eminent reformers….” Morals and Dogma of the Ancient and Accepted Scottish Rite of Freemasonry, by Albert Pike, Washington D.C., 1958, pp. 277, 525. The secrets of Masonry are protected by the most vile of blood oaths, every one of which is an offence to Jesus. The name and nature of the Masonic deity is an offense to the one true God. It is taught in the Royal Arch degree that Masonry draws its teachings and powers from three great teachers and Gods. The combined deity is represented as a three-headed god, whose name is JoaBulOn, which stands for Jehovah, Baal, and Osiris. Every time Masons pronounce that name in the Masonic prayer of worship, they have defiled the Holy name of God. In the Shrine, the initiate swears a terrible binding oath in the name of “Allah, the God of our Fathers.” Mohammed was a false prophet and Allah is a god who has destroyed nation after nation of his followers. The red Fez itself was originally a badge of honor worn only by a Muslim who had actually killed a Christian and dipped his cap in the martyr’s blood. At the Apron lecture, the Mason is told that the lambskin apron will be his covering at the great white throne judgment of God. The prayer and dedicatory sounds great, but there is only one Great white throne judgment and it is the judgment of the damned (Rev. 20:11). The Lodge promises godhood through the Lodge, the usurping of Christ‘s Melchizedek Priesthood, the Holy communion of the dead, drinking wine from the carved out top of a human skull, etc. Acceptance of the Bible as the inspired, infallible, authoritative Word of God. God became flesh in the physical man Jesus. Christ atoned for man’s sin through his death on the cross. Christ arose in bodily form from the grave, conquering death and proving he is God. Freemasonry is incompatible with these 4 characteristics of orthodox Christianity. Therefore one cannot simultaneously be a Mason and a Christian. Christians that are Masons must leave the Lodge and repudiate all oaths or suffer the rejection of Christ and the judgment of God’s Word. Masonic Doctrine of Blood Oaths Blood Oaths on penalty of mayhem and violent death are administered at the end of initiation into all Masonic degrees, binding the initiate to protect the “secrets” of the degrees. These oaths of obligation (usually called just “obligation”) are considered unbreakable, and are (collectively) the thing that makes a man a Mason. In this way, these oaths are the cornerstone of Masonry. 3. Masons bind themselves to the penalty of having their bodies disemboweled. 1. The prevalent use of offensive concepts, titles, and terms such as “Worshipful Master” for the leaders of the lodge; references to their buildings as “mosques,” “shrines,” or “temples”; and the use of such words as “Abaddon” and Jah-Bul-On,” the so-called secret name of God. To many, these terms are not only offensive but sacrilegious. 2. The use of archaic, offensive rituals and so-called “bloody oaths” or “obligations,” among those being that promised by the Entered Apprentice: [not listed for lack of space] or that of the Fellow Craft degree: [not listed for lack of space] Or that of the Master Mason: [not listed for lack of space] Or that of other advanced degrees with required rituals considered by many to be pagan and incompatible with Christian faith and practice. Even though these oaths, obligations and rituals may or may not be taken seriously by the initiate, it is inappropriate for a Christian to “sincerely promise and swear,” with a hand on the Holy Bible, any such promises or oaths, or to participate in any such pagan rituals. 3. The recommended readings in pursuance of advanced degrees, of religions and philosophies, which are undeniably pagan and/or occultic, such as much of the writings of Albert Pike, Albert Mackey, Manly Hall, Rex Hutchins, W.L. Wilmhurst and other such authors; along with their works, such as Morals and Dogma, A Bridge to Light, An Encyclopedia of Freemasonry and The Meaning of Masonry. 4. The reference to the Bible placed on the altar of the lodge as the “furniture of the lodge,” comparing it to the square and compass rather than giving it the supreme place in the lodge. 5. The prevalent use of the term “light” which some may understand as a reference to salvation rather than knowledge or truth. Even though many Masons understand that the “purity of life and conduct” can only be achieved through faith in Jesus Christ, others may be led to believe they can earn salvation by living a pure life with good conduct. 7. The heresy of Universalism (the belief all people will eventually be saved), which permeates the writings of many Masonic authors, which is a doctrine inconsistent with New Testament teaching. 8. The refusal of most lodges (although not all) to admit for membership African-Americans. “We may not call in question the propriety of this organization; if we would be Masons we must yield private judgment. ‘To the law and to the testimony—if any man walk not by this rule it is because there is no light in him.”’—Pierson’s Traditions of Freemasonry, p. 30.”That this surrender of free-will to Masonic authority is absolute (within the scope of the landmarks of the order) and perpetual, may be inferred from an examination of the emblem (the shoe or sandal) which is used to enforce this lesson of resignation. The esotery of the Masonic rituals gives the fullest assurance of this: “once a Mason always a Mason” is an aphorism in our literature conveying an undeniable truth.”—Morris’ Dictionary of Freemasonry, p. 29. “A Mason should know how to obey those who are set over him, however inferior they may be in worldly rank; or condition.” —Macoy’s Masonic Monitor, p. 14. “Disobedience and want of respect to Masonic superiors is an offense for which the transgressor subjects himself to punishment.”—Mackey’s Masonic Jurisprudence, p. 511. “As a presiding officer the Master is possessed or extraordinary powers which belong to the presiding officer of no other association” Mackey’s Masonic Jurisprudence, p. 344. “The powers and privileges of the Master of a lodge are by no means limited in extent.”-Chase’s Digest of Masonic Law, page 380. “An affirmation is not equivalent to an oath in Masonry however it may be in common and is not legitimate in the working of the lodge.”-Ibid. p.13. “The Covenant is irrevocable. 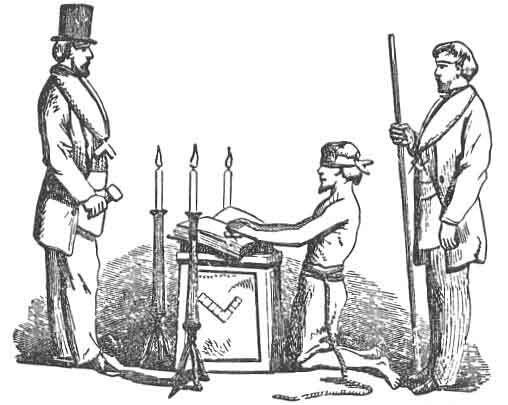 Even though a person may be suspended or expelled; though he may withdraw from the Lodge, journey into countries where Masons cannot be found, or become a subject of despotic governments that persecute, or a communicant of bigoted churches that denounce Masonry, he cannot cast off or nullify his Masonic covenant; No law of the land can affect it-no anathema of the church weaken it. It is irrevocable.” Webb’s Freemasons’ Monitor, p. 240. Note: This accounts for many strange and mysterious proceedings in our would-be courts of justice and in the churches. NO law of the land (that is, civil law,) can even affect this lodge oath or covenant. No anathema of the church (that is, divine law), can weaken it. Is it any wonder that criminals go scot-free when the sheriff that impanels the jury, enough of the jurors impaneled to bring in a divided verdict, enough witnesses drummed up to make the evidence appear contradictory, the attorneys of the prosecution and of the defense, and the judge on the bench, are irrevocably bound to the prisoner at the bar as sworn brethren, by an obligation considered paramount to all others, civil or divine? Is it anything strange that there is trouble in the church when the members are bound up, by this strong covenant, with saloon-keepers, irreverent scoffers, and other evil-minded men, in sworn brotherhood? Can a man simultaneously be a Christian and a Freemason? Teachings and practices of the secret fraternal order known as the Free and Accepted Masons. There are 4.75 million members worldwide, mostly in the U.S. and other English-speaking countries, and no central authority. Its ideals include fellowship, religious toleration, and political compromise. Drawing on guild practices of medieval stonemasons, the order’s first Grand Lodge was organized in London (1717). In America, Masons were active in the Revolution and continued as a force in later politics. In Europe, they included Voltaire, Goethe, Haydn, Mazzini, and Garibaldi. 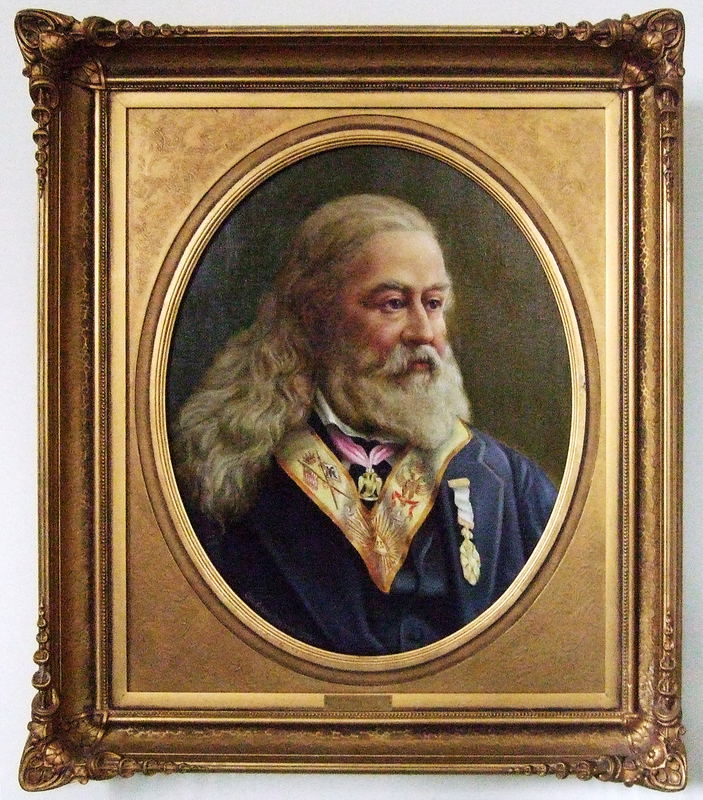 Freemasonry’s identification with 19th-century. bourgeois liberalism led to reaction, e.g., in the U.S., the Anti-masonic Party; its anticlericalism brought the hostility of the Roman Catholic Church. Totalitarian states have always suppressed Freemasonry. 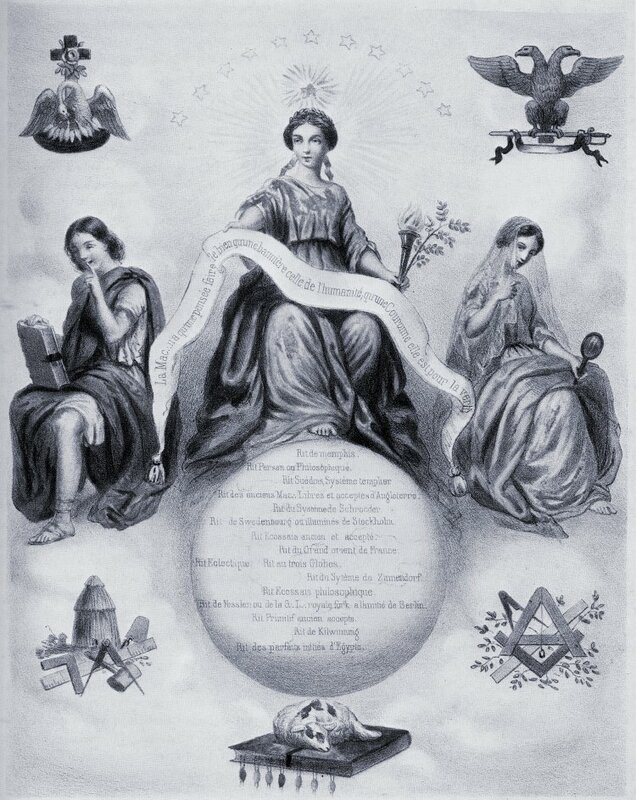 Masons have a complex systems of rites and degrees, subsidiary organizations for women and children, and lodges noted for their parades and fraternal gatherings. The term fraternal society, used interchangeably with fraternal order, refers to voluntary associations that feature elaborate secret initiations. Some orders provide a simple form of life insurance; nearly all exclude women. Nowadays the most important fraternal societies are the Freemasons, Independent Order of Odd Fellows, Knights of Pythias, and the Benevolent and Protective Order of Elk. The origins of fraternal orders are obscured by a tangle of implausible legends and dubious histories. Nineteenth-century Freemasons claimed to be heirs of a tradition extending back to the founding of King Solomon’s temple. Historians of the Knights of Pythias made a case that Pythagoras was the first Pythian, despite the awkward fact that the order apparently had been founded in Washington, D.C., in 1864. The Improved Order of Red Men, established in the 1830s, claimed descent from the Sons of Liberty of the American Revolution. Without doubt, the Freemasons were entitled to claim that they were the nation’s oldest order. But contrary to the claims of some enthusiasts, Freemasonry originated in London in the early 1700s as a stonemasons’ trade guild. The order soon became a club for tradesmen, merchants, and a few much-celebrated noblemen. In the 1730s and 1740s a handful of Masonic lodges were established in coastal towns in America. Although these lodges were dominated by a mercantile elite, some tradesmen were admitted, such as Benjamin Franklin who, as a young printer, became grand master of Pennsylvania Freemasons in 1734. Freemasonry became associated with patriotism during the Revolution, largely because George Washington and many of his generals belonged to the order. This patriotic association was strengthened when Washington took his oath of office as president upon a Masonic Bible. Despite the order’s association with the Founding Fathers and its profession of universal brotherhood, American officials refused to recognize the legitimacy of black Freemasons, who in 1775 had been admitted to a lodge composed mostly of Irish soldiers stationed in Boston harbor. The leader of the blacks, Prince Hall, subsequently received a dispensation from English officials and established African Lodge No. 459. Black Freemasonry, usually called Prince Hall Freemasonry, became popular among middle-class blacks. During the early 1800s the number of Masonic lodges multiplied rapidly. The order especially appealed to an emerging middle class of lawyers, commercial farmers, and independent tradesmen, many of whom were growing impatient with orthodox religion and established political elites. Tensions between Masonic leaders and the conservative ministry smoldered until 1826, when a disgruntled ex-Freemason, William Morgan, announced his intention of publishing the secret Masonic rituals. Morgan was abducted by Freemasons and was never seen again. What happened to him has never been fully explained. Twenty-six Masons were indicted on murder and related charges. Only six came to trial; four were convicted of conspiracy and sentenced to terms ranging from several months to two years in jail. When it became known that many of the jurors and prosecutors were Masons, as was Governor DeWitt Clinton of New York, a coalition of ministers and opportunistic politicians formed to suppress the order. The Anti-Masonic party became the first significant third-party in American politics. Though short-lived as a political movement, Anti-Masonry generated intense public pressure and forced thousands of members to renounce the order and hundreds of lodges to relinquish their charters. By best estimate membership declined from 100,000 in the mid-1820s to 40,000 a decade later. Many renouncing Freemasons flocked into the Odd Fellows. Odd-Fellowship originated in late-eighteenth-century Great Britain among industrial workers who sought to mitigate the effects of the Industrial Revolution and the English Poor Laws. The order assisted members in dire circumstances and provided them a decent burial. In 1819 English immigrants established the first American lodge of Odd Fellows in Baltimore. During its early decades the order met in taverns and functioned as little more than a drinking society. But the influx of ex-Freemasons during the 1830s and 1840s completely transformed American Odd-Fellowship. This “new and more refined” group, as one nineteenth-century historian described them, gained control of the order, raised fees beyond what most workers could afford, banned liquor from meetings, launched a program to build “temples,” and wrote and performed elaborate successions of initiatory rituals. By the 1850s Freemasonry, having just begun to recover from the Morgan debacle, adopted a similar program. During the last third of the nineteenth century, fraternal orders, featuring reform and ritual, proliferated among the urban middle classes. By 1900 there were more than three hundred orders; total fraternal membership exceeded 6 million. Ambitious clerks, businessmen, and politicians used the orders to cultivate contacts and establish ties with clients and like-minded people elsewhere. Others found satisfaction in the exotic rituals, which provided a religious experience antithetical to liberal Protestantism and a masculine “family” vastly different from the one in which most members had been raised. Partly to attenuate women’s complaints about the secrecy, the cost of membership, and the time members spent away from home, most orders supported creation of ladies’ auxiliaries. The Odd-Fellows established the Daughters of Rebekah (1851), and Freemasons, the Order of the Eastern Star (1869). Early in the twentieth century, however, many young middle-class men, preferring the recreational clubs and service organizations such as Rotary and Kiwanis, refused to follow their fathers into the lodge. Robert and Helen Lynd, in their study of Muncie, Indiana, in the 1920s, reported that “the great days of the lodges have vanished.” Aggressive recruitment policies and relaxed admission standards temporarily masked the weakness of most lodges. But the onset of the Great Depression brought about the collapse of the institutional foundations of the fraternal movement as members could no longer afford to pay dues and thousands of lodges, unable to meet mortgage payments, went bankrupt. The major orders together lost nearly a million members; hundreds of others passed out of existence entirely. After World War II, social activities, philanthropy, and community service took precedence over the rituals, which were abbreviated or occasionally abandoned. Most orders languished and increasingly became identified in the public mind with the televised antics of Jackie Gleason’s Ralph Kramden, member of the fictional Loyal Order of Raccoons. In recent decades, however, Freemasonry has gained many new adherents, especially from among white-collar workers and immigrants. Dorothy Ann Lipson, Freemasonry in Federalist Connecticut, 1789-1835 (1977). American political party founded to counter the supposed political influence of Freemasonry. It arose in Western New York state after the disappearance (1826) of William Morgan, a former Mason who had written a book purporting to reveal Masonic secrets. Freemasons were said, without proof, to have murdered him. At Baltimore, in 1831, Anti-Masons held the first national nominating convention of any party, and issued the first written party platform. In 1834 they helped form the Whig Party. Organization whose members, aims, and rites are kept secret. Membership is by Initiation. In some Cultures secret societies are the sole means by which Mysteries and folkways are transmitted, generally in coming-of-age rituals. They are usually limited to men, but in China the secret Hung Society for women lasted over 1,500 years. Modern secret societies (e.g., fraternal orders, Freemasonry) offer members various kinds of mutual aid. Some governments and churches oppose them as fostering subversion and violence. The Anti-Masonic party, the first third-party movement in the United States, arose in response to the disappearance of William Morgan, shortly after his release on September 12, 1826, from a Canandaigua, New York, jail. Morgan had threatened to publish a book divulging the secrets of Freemasonry; opponents of the order asserted that a conspiracy among Masons had led to his arrest on trumped-up charges and subsequently to his being kidnapped and murdered. The Anti-Masonic movement grew rapidly, drawing its initial following from farmers and skilled craftsmen – many of them with ties to evangelicalism and the temperance movement. They maintained that the Masonic order’s secrecy, rituals, and aristocratic character posed a threat to republican democracy. Anti-Masonry also provided a vehicle for rural people to express their antipathy to the cities, and for ordinary people to voice their resentment of the powerful leaders, many of them Masons, who dominated the nation’s public affairs. From western New York, the movement spread through New England, the Mid-Atlantic states, and Ohio and Michigan. Anti-Masons elected a governor of Rhode Island in 1833, controlled Vermont and Pennsylvania for several years, and played a significant part in local politics in both Massachusetts and New York. In 1831, the Anti-Masonic party nominated William Wirt to run for president; in the process, it became the first American political party to select a presidential candidate by means of a national convention and the first to adopt an official party platform. Wirt carried only one state (Vermont) in 1832, but the party continued to grow, offering an increasingly general program of reform. As it expanded, it came to be dominated by new members more impelled by personal ambition or by a general opposition to the Jacksonian Democrats than by Anti-Masonry. At its second and final convention (1835), the Anti-Masonic party approved a slate for 1836 identical to that of the new Whig party, and thereafter it disappeared into the Whig coalition. During its brief career, however, Anti-Masonry had played an important part in northeastern politics and had helped launch the careers of such leaders as William Lloyd Garrison, William H. Seward, Thurlow Weed, and Thaddeus Stevens. Secret societies are in conflict with the teachings of Holy Scripture. A Christian must never affiliate with any organization that 1) yokes together believers with unbelievers in unholy alliances (2 Cor. 6:14-18); 2) requires a pledge to unscriptural oaths which are sealed by using the name of God improperly or in vain (Ex. 20:7, Lev. 5:4-6, Matt. 5:34-37, James 5:12); 3) represents itself as providing teaching in harmony with the Bible when in fact it does not (2 Peter 3:16); 4) represents itself as being religious and offers a false hope of salvation through works, yet dishonors the only true God and our Savior the Lord Jesus Christ (John 17:3, 1 Tim. 2:3-6, Col. 2:8-10, Eph. 2:8,9). The Christian should “be careful to do what is right in the eyes of everybody” (Rom. 12:17). Secretively meeting behind closed doors in a “lodge” where activities are carried on behind a cloak of secrecy, in favor of fellow members, usually for economic, social, or political advantage hardly describes doing what is right in the eyes of everybody. “Come out from them and be separate, says the Lord” (2 Cor. 6:17). This is God’s advice for Christians and is certainly applicable in regard to secret societies. There is a Christian universalism. God has His elect in every age and every nation. Ever since the fall of man the Son of God has gathered the elect into His church by His Word and Spirit. In Christ Jesus there is neither Jew nor Greek, bond nor free, male nor female, for all are one in Him (Galatians 3:28). John saw the four living creatures and the four and twenty elders fall down before the Lamb and he heard them sing: “Thou wast slain, and didst purchase unto God with thy blood men of every tribe, and tongue, and people, and nation” (Revelation 5:9). Masonry also lays claim to universalism, but its universalism differs radically from that of Christianity in that it denies Christian particularism and exclusivism. Christianity claims to have the only true book, the Bible. Masonry places this book on a par with the sacred books of other religions. Christianity lays claim to the only true God, the God of the Bible, and denounces all other Gods as idols. Masonry recognizes the Gods of all religions. Christianity describes God as the Father of Jesus Christ and of those who through faith in Him have received the right to be called the sons of God. The God of Masonry is the universal father of all mankind. Christianity holds that only the worship of the God who has revealed Himself in Holy Scripture is true worship. Masonry honors as true worship the worship of numerous other deities. Christianity recognizes but one Saviour, Jesus Christ, the only Mediator between God and man. Masonry recognizes many saviours. Christianity acknowledges but one way of salvation, that of grace through faith. Masonry rejects this way and substitutes for it salvation by works and character. Christianity teaches the brotherhood of those who believe in Christ, the communion of saints, the church universal, the one body of Christ. Masonry teaches the brotherhood of Masons and the universal brotherhood of man. Christianity glories in being the one truly universal religion. Masonry would rob Christianity of this glory and appropriate it to itself. Christianity maintains that it is the only true religion. Masonry denies this claim and boasts of being Religion itself. Masonry Beyond the Light, by William and Sharon Schnoebelen, ISBN 0937958387, $9.95, A former high-level Mason reveals secrets about this dangerous group. Many Christians believe Masonry is a fine, Christian organization. But as Bill Schnoebelen climbed to Masonry’s 32nd degree he discovered horrifying facts about this organization that lower level Masons never learn. Now a born again Christian., Schnoebelen reveals all. Learn shocking facts like · To be a Mason, you must first take an oath that is a denial of Jesus Christ. · The father of modern Masonry said, “Lucifer is God!” This fascinating and informative story will give you an unusual insight into the world of Masonry from one who was on the inside, and will prepare you to show others why it is impossible for anyone to be a Christian and a Mason at the same time. Freemason Gang Runs Police Department Investigation Reveals! UK Police & Press Leak: Freemasons are in Control ! #AceHistoryNews says “Baptism” goes back to the time of Christ being immersed into water, when “John the Baptist“ was in charge of the ceremony. Though the word and meaning of to be baptised goes back even further and the word Baptism comes (from the Greek noun βάπτισμα baptisma; see below) is a Christian rite of admission and adoption, almost invariably with the use of water, into theChristian Church generally and also a particular church tradition. The canonical Gospels report that Jesus was Baptised a historical event to which a high degree of certainty can be assigned. Baptism has been called a sacrament and an ordinance of Jesus Christ. In some traditions, baptism is also called christening, but for others the word “Christening” is reserved for the baptism of infants. The usual form of baptism among the earliest Christians was for the candidate to be immersed, either totally (submerged completely under the water) or partly (standing or kneeling in water while water was poured on him or her). While John the Baptist‘s use of a deep river for his baptism suggests immersion, pictorial and archaeological evidence of Christian baptism from the 3rd century onward indicates that a normal form was to have the candidate stand in water while water was poured over the upper body. 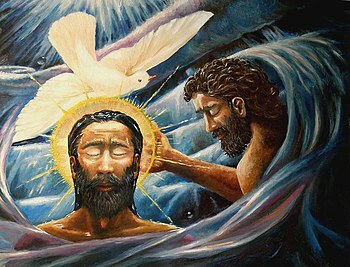 Other common forms of baptism now in use include pouring water three times on the forehead; a method called affusion. Martyrdom was identified early in Church history as “baptism by blood”, enabling martyrs who had not been “Baptised” by water to be saved. Later, the Catholic Church identified a baptism of desire, by which those preparing for baptism who die before actually receiving the sacrament are considered saved.As evidenced also in the common Christian practice of infant baptism, baptism was universally seen by Christians as in some sense necessary for salvation, until Huldrych Zwingli in the 16th century denied its necessity. Today, some Christians, particularly Christian Scientists, Quakers, the Salvation Army, and Unitarians, do not see baptism as necessary, and do not practice the rite. Among those that do, differences can be found in the manner and mode of “Baptising” and in the understanding of the significance of the rite. Most Christians “Baptise“ in the name of the Father, and of the Son, and of the Holy Spirit” (following the Great Commission), but some “Baptise” in Jesus’ name only. Most Christians baptize infants; many others hold that only believer’s baptism is true baptism. Some insist on submersion or at least partial immersion of the person who is baptized, others consider that any form of washing by water, as long as the water flows on the head, is sufficient. The term “baptism” has also been used to refer to any ceremony, trial, or experience by which a person is initiated, purified, or given a name. 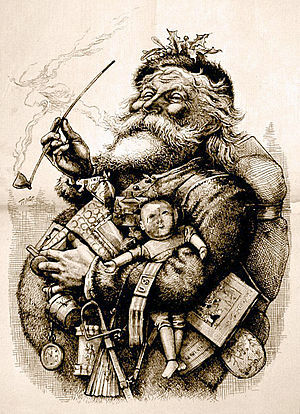 Santa Claus, and gift-giving during the peak of winter was not always celebrated in said manner. Many of the traditions connected to the celebration of the birth of Jesus Christ have nonChristian origins. Items like the Yule log, the Christmas tree, and the very placement of the observance during the darkest time in the calendar year stem from pre-Christian religious observances. Bruce Forbes, professor of religious studies at Sioux City, Iowabased Morningside College explained to The Christian Post in an earlier interview that many current Christmas rituals emerged during the difficult winters pagans often encountered. Candlelight conquered darkness and evergreens were prized for remaining green in even the brutal winters. Festive activities like drinking and dancing reduced isolation and kept people positive, noted Forbes. Some in the modern-day still adhere to the pagan meanings of the pre-Christian aspects of the Christmas holiday, reported Jefferson Calico of kentucky.com. “Groups of people who follow contemporary pagan religious traditions will be gathering to celebrate the old/new holiday of Yule: the Festival of Light in contemporary pagan nature religion,” wrote Calico. Scholars attribute the usage of pagan celebratory aspects to Christianity’s spread throughout Europe and the Roman Empire. Christian missionaries sought to convert non-Christian populations and were willing to adapt certain festive attributes to their own observances. “Christians of that period are quite interested in paganism,” said Philip Shaw, researcher of early Germanic languages and Old English at Leicester University to LiveScience. Another reason in pagan characteristics entering into the Christian holy day was the sense by most in the early Church that the birth of Jesus was not an important holiday to observe. #AceGuestNews says this is a post courtesy of a member of our “History and Research Group ” and well worth a read. #AceGuestViews: This is his post in its entirety and his views. The success of the novel “The Da Vinci Code” is perhaps the single most among factors which brought to public attention the Priory of Sion… History however, points out that there was a Catholic monastic order in Jerusalem by that name during the same time as the Knights Templar. This was proven to be fact by way of a papal bull stating that this order had monasteries and abbeys at Mt. Carmel in Palestine, as well as properties in southern Italy and France. In addition, an organization called the Priory of Sion registered with the bureau of records in Annemasse, France, in 1956. A level of infamy was generated about the Priory of Sion because of a man named Pierre Plantard, who apparently lied his way across Europe, as he claimed to be secretary-general and then grand master of the Priory of Sion. While Plantard was allegedly serving the Priory in the 1960s, he appears to have forged documents that alluded to the survival of a sacred bloodline of the Merovingian’s, a line of Frankish kings. These documents were used as part of the research for the book “Holy Blood, Holy Grail. 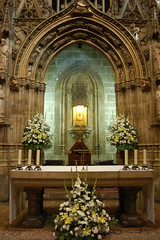 When authors Michael Baigent, Richard Leigh, and Henry Lincoln published their work in 1982, it immediately became a bestseller and stirred up a world-wide controversy over its premise that there’s a lineage still existing that stems directly from Jesus Christ… “Holy Blood, Holy Grail” caused such a sensation that it was subsequently banned by the Catholic Church. Dan Brown’s book The Da Vince Code, and other books inspired by this questionable research followed, all of which put forth this controversial theory that descendants of Jesus Christ have survived and that the Priory of Sion kept the secret. Plantard ultimately admitted that he forged the documents because he wanted to create the illusion that he too, was part of the Merovingian line. Scholars then turned on Holy Blood, Holy Grail because it utilized resources that have been more or less proven to be false. The Da Vinci Code was also widely attacked, and several books have been written that attempt to debunk its whole premise. Plantard is reported to have resigned as grand master of the Priory of Sion in 1984 after suffering public humiliation, and died in February of 2000. The controversy did not diminish or subside following Plantard’s confession and death, but rather, it in fact continued to roar by way of The Da Vinci Code. On the other hand, what do we know about the Priory of Sion… A conclave of Calabrian monks left the Belgian Abbey of Oval in 1090 to journey to the Holy Land as pilgrims. Five years later, the first Crusade was launched, which ended with the capture of Jerusalem from the Muslims in 1099. One of the key players in the success of this venture was Godfrey of Bouillon, the devout knight from France. 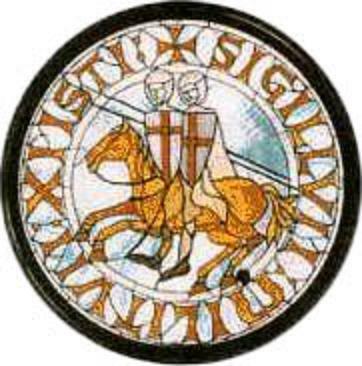 After the capture of Jerusalem the group of Calabrian monks and others elected Godfrey as de facto king of Jerusalem, but he refused the title and instead accepted that of “Protector of the Holy Sepulcher.” Godrey then founded a group of 12 knights called “the Order of the Holy Sepulcher,” which eventually evolved into the Knights Templar. As the result of the Calabrian monks support of Godfrey, which was based on the belief that he was a descendant of the Merovingian’s, and therefore as a descendant of King David through Jesus and Merovech, he was able to make a place for the monks in an abbey on Mount Zion. Sometime between 1099 and 1118, it’s believed that this group of monks (now called the Order of Sion) and the men who would later be known as the Knights Templar became one organization and unified with the same leadership. There is no record of this happening, but the Order of Sion did occupy and abbey on Mount Zion until about 1291, when Jerusalem was recaptured by Muslims…Mount Zion was also where the Knight Templar made their headquarters. 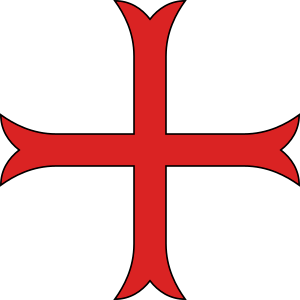 The Knights Templar was formally recognized by the pope in 1139; and according to Holy Blood, Holy Grail, the Templars and the Order of Sion remained allied until an event called “the cutting of the elm” at Gisors in 1188. The history of the Templars also refers to the symbolic cutting of the elm, and the first grand master of the Priory of Sion is listed as Jean de Gisors, who was master of the castle and lands where the incident took place. There was no acrimony between the Order of the Sion and the Knights Templar when they parted ways, as they stayed in contact for centuries subsequent. Furthermore, these two organizations shared much in the way of information and knowledge and maintained constant communication after their formal separation. Subsequent to vacating their abbey in Jerusalem, the Order of Sion seems to have existed for several hundred years until it was finally absorbed by the Jesuits in the 17th century… It is interesting to note that the Jesuits were suppressed by the Catholic Church, and this continued until their restoration in 1814. There is speculation that this may have been due to the influence of the absorbed Order of Sion? And there is evidence that the Order of Sion became the Priory of Sion after the cutting of the elm.